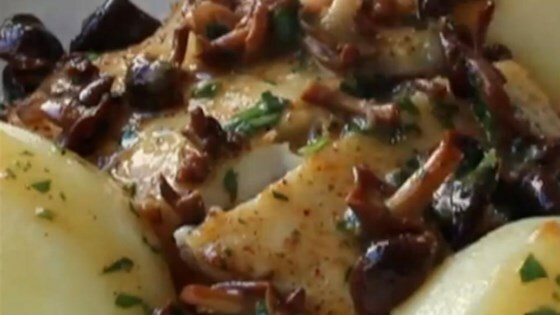 "Mushrooms and halibut have a natural affinity for each other, and both are wonderful with the lemon-parsley butter sauce. So, whether you fear cooking fish or not, I hope you give this super simple yet fabulous recipe a try soon." Heat oil and 1 tablespoon butter in heavy skillet over medium-high heat until butter melts and begins to foam. Add mushrooms and a pinch of salt; saute in hot butter and oil golden brown, about 5 minutes. Push mushroom to the edges to clear a space in the center of the skillet. Season halibut on each side with salt and cayenne pepper. Place halibut fillets in the center of the skillet and cook until the fillets begin to flake, 3 to 4 minutes per side. Transfer halibut to a warm serving plate. Pour the water into the pan and bring to a boil while scraping the browned bits of food off of the bottom of the pan with a wooden spoon, until water is reduced by half, 1 to 2 minutes. Pour lemon juice into mushroom mixture and stir. Stir butter and parsley into mushroom mixture. Stir constantly until butter melts and forms a sauce; remove from heat and season with salt and black pepper. Spoon sauce and mushrooms over halibut. I would like to see the “half lemon” converted to tablespoons. I doubled this recipe and my lemon was large. The dish was too acidic. Tasty. We used white wine instead water and subbed cremini mushrooms. Served over rice. Outstanding. I doubled sauce, used white wine instead of water. Served it over rice. Lightly coat fish with flour before frying to give it a little more crust. My first try of a Chef John recipe. Very easy to follow. Helps to have everything ready before starting. Goes fast. Tasted great, will do again. used oyster+ white mushrooms, tasted great!